My Mom’s sweet and sour meatballs recipe! 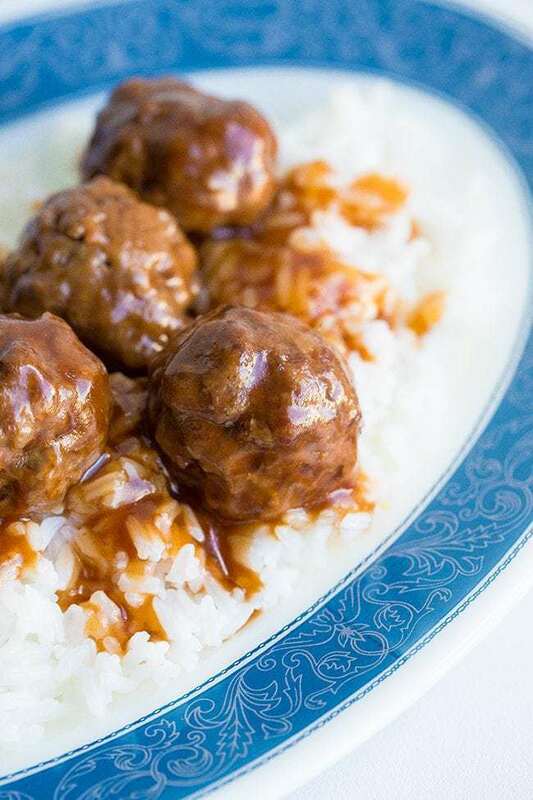 These meatballs are baked in the oven in a retro sweet and sour sauce that can’t be beat! 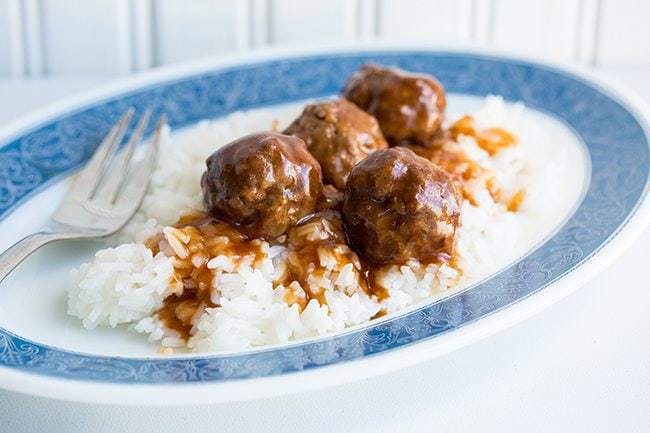 The success of these sweet and sour meatballs is all due to the sauce – and this is a great sauce. The ketchup is a must have in it, and adds that extra zing! Mike’s mom used to make this for him many years ago and it’s still one of his favorite recipes. 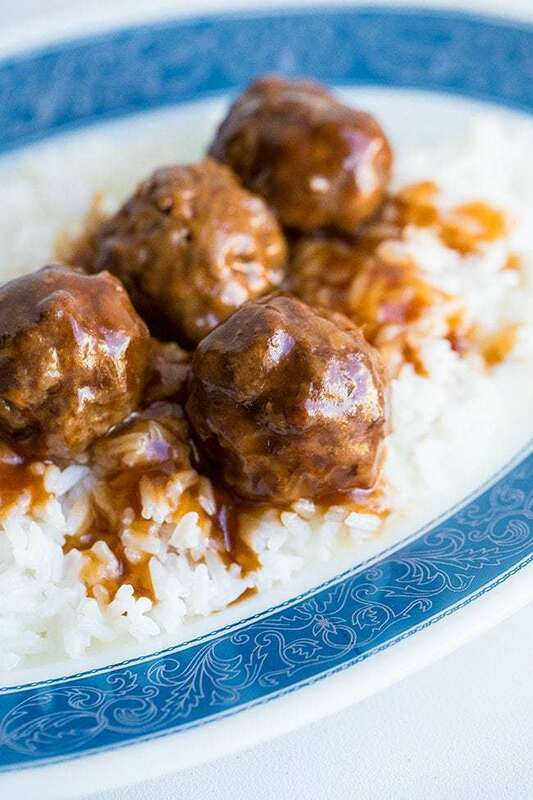 The best sweet and sour meatball recipes simply must have ketchup in it, that’s what makes this classic old fashioned meatball recipe the best one you’ll ever taste! together in a stand mixer bowl. Use the paddle attachment and mix on low until combined. Roll the meat mixture into meatballs, it makes approximately 24. 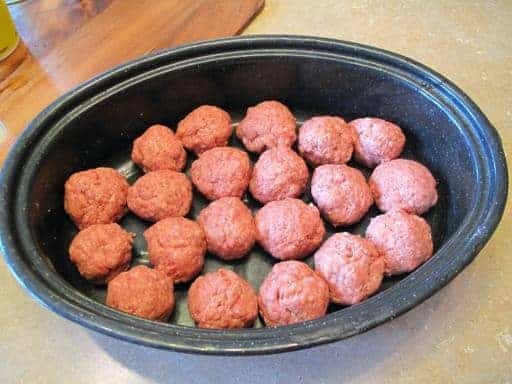 Place the meatballs into a preheated 375°F oven. After about 20 minutes, take the meatballs out and drain the fat. 30 minutes depending on the size of your meatballs. Mix the sauce ingredients together in a medium sized sauce pan until fully combined. Bring to a low rolling boil, and cook until it thickens. Remove from the heat and set aside. 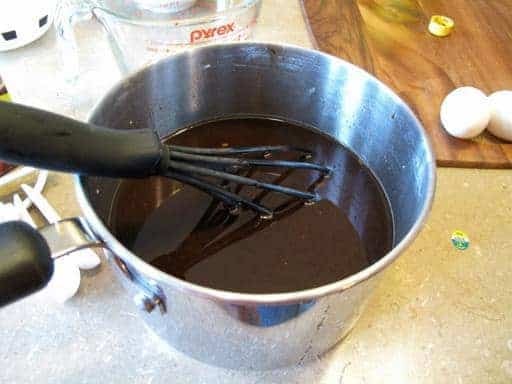 Mix the brown sugar, soy,vinegar, water and ketchup in a pot. 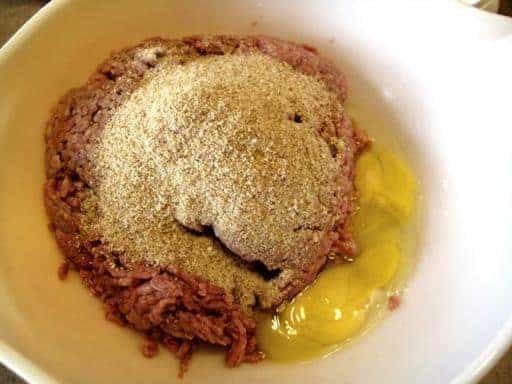 Combine the breadcrumbs, egg and ground beef together in a bowl. Roll the meat mixture into meatballs, whichever size you want. I prefer slightly larger ones, they don’t dry out as quickly. Pop them into the 375 degrees oven and start them cooking. 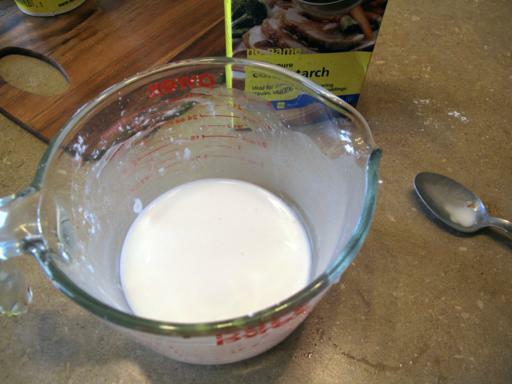 Mix your flour or cornstarch in cold water…. ..and add it to the sauce. After about 20 minutes, take the meatballs out for a second, and drain the fat out of them. And to gross you out and demonstrate why I do this, look at the cup of fat that I drained. Eeeew. Now you can cover those babies up with sauce. Finish cooking them until done, and they look oh-so saucy and delish like this! When cooking meatballs I like to insert a thermometer in them and make sure they have reached a temp of at least 165 degrees. With all the beef recalls lately, it’s far better safe than sorry! It’s also good to be familiar with safe internal temperatures. 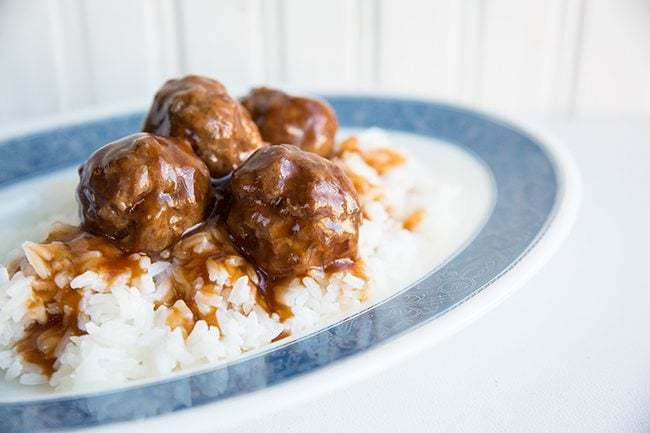 I love sweet and sour meatballs on rice, especially bad-for-you, white rice! You don’t have to commit to eating these on rice, however. If you really want to go all retro, stick toothpicks in these babies and call them an appetizer. I’m thinking that these might make it into my second cookbook as just that : sweet and sour meatball appetizers. Nothing says classy like a sweet and sour meatball on a toothpick….. Happy cooking everyone! These meatballs are one of THE most popular recipes here on The Kitchen Magpie, and I’m sure it’s because they are a retro delight! Everyone loves a good sweet and sour meatball! My Mom's sweet and sour meatballs recipe. These meatballs are baked in the oven in a retro sweet and sour sauce that can't be beat! Mix the sauce ingredients together in a medium sized sauce pan until fully combined. Bring to a low rolling boil, and cook until it thickens. Remove from the heat and set aside. 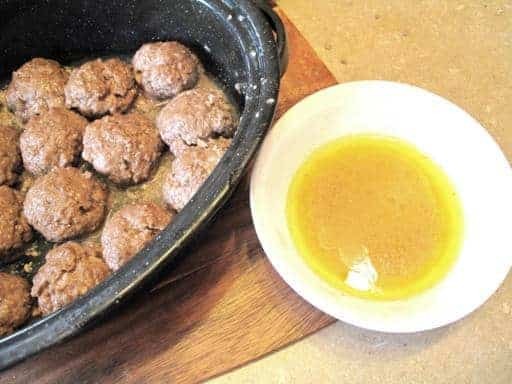 Combine the meatball ingredients : breadcrumbs, garlic, salt, pepper, egg, onions and ground beef together in a stand mixer bowl. Use the paddle attachment and mix on low until combined. This makes for the BEST distribution of egg and crumbs through the meat! After about 20 minutes, take the meatballs out for a second, and drain the fat out of them. Now you can cover those meatballs up with sauce. 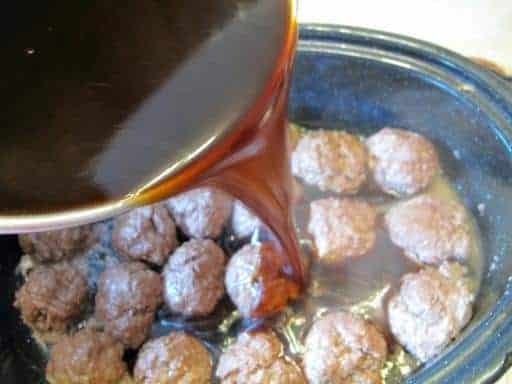 Pour the sauce over the meatball, covering them completely. Finish cooking them until done, and they look oh-so saucy and delicious. This can take up to another 20-30 minutes depending on the size of your meatballs. When cooking meatballs I like to insert a thermometer in them and make sure they have reached a temp of at least 165 degrees. With all the beef recalls lately, it’s far better safe than sorry! I love sweet and sour meatballs on rice, especially bad-for-you, white rice! Serve with the side of your choice. NOTE that I make a double batch of these now, using two pounds of ground beef! This makes around 24! Karlynn, thank you!!! I’ll be honest, I rarely make my own meatballs anymore & have been using your sauce with leftover roast pork, diced or because I love it so much, roast up a small pork loin & chop it up. Still a very fast meal! I do saute a knob of fresh ginger & 2-3 cloves of garlic in a small amount of light oil before adding the the other sauce ingredients. I also add some peppers, white onion & fresh pineapple cubes just before serving because I find that easier than prepping another veg, another pot, etc. I NEVER alter your base sauce ingredients because it’s perfect as written! And I’m with you, this loves white rice!! Thank you for sharing all your recipes! The sauce instructions are confusing. Do you say to put all the ingredients into a pot because it’s meant to be cooked first? From what I can tell you don’t include instructions to cook the sauce on the stovetop first so I’m a bit confused as to why it would make sense to combine the ingredients in a pot, and later add in the cornstarch slurry if it’s not being cooked in the pot. Do you just pour the mixed sauce ingredients over the meatballs and it thickens in the baking dish? Yes, heat all the sauce ingredients. 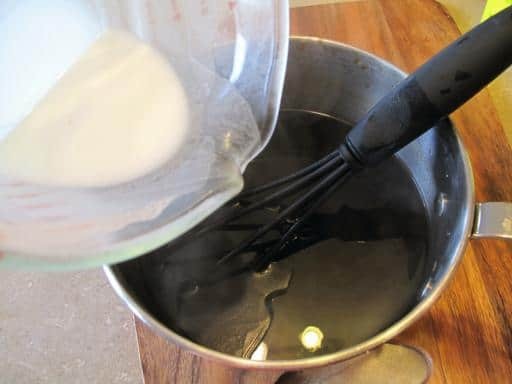 Reserve a small amount of your water to mix a slurry with your cornstarch. Bring it to a VERY slow bubble and simmer at that point a few minutes (after adding cornstarch slurry), stirring almost constantly. It will thicken a bit. I like to add my meat into the sauce & simmer at a low bubble for a few minutes before serving. Don’t simmer too long at this point it the meat will be saturated with the sauce and your flavour combination will get lost. Making this sauce for the 4th or 5th time tonight. I use the sauce with leftover roast pork or cook a tenderloin on purpose and dice it up into bite size chunks. Also add a good nob of fresh ginger, some assorted sweet peppers and fresh pineapple. The sauce if over the top good replacing my mother’s recipe. I printed the recipe off and made it from there. I watched the video afterwards and noticed you put minced garlic in the meatballs; however, our recipe doesn’t call for garlic. I wish I had watched the video first, and now it’s too late because they’re cooking in the oven. Perhaps you should put garlic in the printed recipe? This is my fave sauce. I make it the same except put 2 tbps Frank’s Red Hot in it Yum. Everyone always loved them ???? Oooh I have heard of the grape jelly ones!!! Made them yesterday! Love them, thanks Karlynn! Love this one! It’s a family favorite here. I’ve used this recipe … The meatballs were delicious (and so easy to make). Awesome to hear!! The old classics are always the best, aren’t they? I can’ t remember the last time I had these, likely at a 4H function! I made these … They were delish! My husband loves this recipe…made as stated! I have made this for a couple of potlucks – it’s a winner! Lol my mom had a cookbook and that was the cover photo casserole! Never forgotten! I made these tonight and they were delish. A new favourite! Wondering … do you heat the sauce on the stovetop before pouring it over the meatballs? Or does the sauce thicken up in the oven? Thanks! best ever! the sauce is awesome with cubed pork too!!! This is probably my most made recipe from your site. I can’t get enough of them! Rice and a green veggie and everyone’s happy!! We love the simple recipe I created for these-one can crushed or diced pineapple with juice and brown sugar bbq sauce. Dump over meatballs and heat to serve. We do these for all our parties and will serve with rice and veggies if doing it as a meal. Alternatively make spaghetti sauce and serve with noodles or on skewers with peppers and mushrooms, onions etc. So versatile!!! This is fool proof, so delicious and easy! It is my go to for meatballs. These are the most delicious meatballs I have ever made. They were a huge hit for dinner tonight. Thank you very much for sharing this great recipe. These were FABULOUS!! Thanks for the great recipe! Always a hit with my family, thanks for a recipe that is going into rotation once a month! I made these with ground chicken, tripled the recipe for a large crowd and added 1 cup of sour cream to help keep them moist, otherwise followed recipe – fabulous!! Everyone raved about them!! Thanks for the recipe. Hi – I’m making this recipe right now. But I see 1 and 1/2 Cups water listed in the ingredients. Does that go in the sauce with the brown sugar, vinegar, soy and ketchup? Like everyone else said, foolproof and delicious! If you use grass fed beef, you would not get near as much fat.. and what fat you get, is delicious and healthy. I would leave it in, Fat is where the favour is. thx for sharing your recipe!